The area I raised my family until 2008, was the Silicon Valley. Back then, we referred to it as "The Peninsula" which is part of the San Francisco Bay Area. We've seen many changes but It really started hopping back in the late 90's - and it was hard not to get caught up in it all. In Redwood City, they have just put into action, 20 new Robots that will roam the city, cruise sidewalks and make personal deliveries for a 9 month pilot program from the company Starship Technologies. This program is one of two - the other in Washington DC. I still love high Tech - but where I live now, is much too remote. 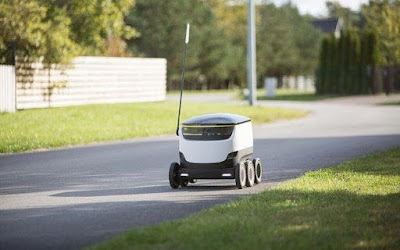 I lived without delivery robots all my life- I can live without them NOW. Ok at first glance I thought what the hell who would fit into such a tiny car, read on not a tiny car at all. LOL - I don't see how much food, mail etc it would fit - Doesn't seem big enough. Oh no, what would my husband do if a robot took over? He loves to run errands!! It looks interesting. Where I live, the cars drive too fast and aggressive. That little robot is smart but would be busted into smithereens on the side of the road here.